Set Top boxes are the devices that receive broadcasting signals, which decode and decompress these to provide a TV ready Video output. Primarily there are three types of set top boxes available in the market- Cable, DTH, and IPTV. Latin America region is one of the key growing regions in global set top box market. Government digitization project, increasing TV penetration and the increasing demand for the technologically advanced set top boxes have led for the growth of set top box market in Latin America region. In Latin America set top box market, countries such as Brazil, Mexico, and Argentina are the key revenue generating countries in this region. According to 6Wresearch, Brazil Set Top Box market is projected to reach $687.4 million by 2020. Changing government policies, initiatives to digitize entire pay TV market and increasing number of pay TV subscribers are fueling the growth of set top box market in Brazil. 13.4 Skyworth Digital Technology Co.
Brazil is one of the fastest growing set top box markets in Latin American region. Changing government laws and policies, increasing TV penetration and the consumer acceptance of technological advanced products are the key factors that are spurring the market for set top box in Brazil. In the country, the market is primarily driven by Direct to home (DTH) set top box followed by the cable TV set top boxes due to low pricing of these products. Technological advancement and coming up of new IPTV and Hybrid set top boxes have further spurred the market growth. The key players in the market include-Cisco Systems, Pace Brasil, Sobre Technicolor, Skyworth Digital Technology, Kaon, Humax, Albis Technology, and Arris. Brazil set top box market declined during the period 2013-14 on account of lower number of new pay TV subscriber additions and delay in digitization of cable TV network. Also, availability of inventory with the market players restricted set top box shipments in the country, thus affecting the growth of Brazilian STB market. However, in the forecast period, market is expected to gain momentum due to government initiative to purchase set top boxes for low income household and increasing penetration of IPTV network. 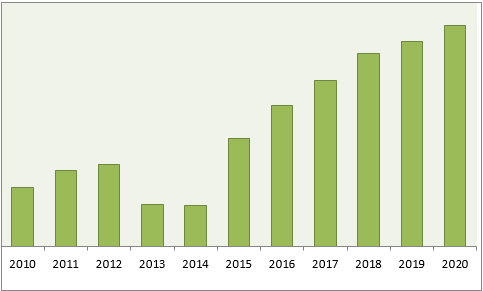 “Brazil Set Top Box Market (2014–2020)” report estimates and forecast overall Brazil set top box market by revenue, by set top box types such as cable TV, DTH, and IPTV set top boxes by regions such as south, north east, central-west and South East, and north. The report also gives the insights on competitive landscape, market share by companies, market trends, company profiles, market drivers and restraints.